An excellent hotel conveniently located to combine business meetings with a little Berlin shopping. In the heart of former West Berlin, this motel offers good-sized rooms and a unique reception/lounge area. A clean, modern and affordable motel, with fast internet WIFI, friendly staff and an unbeatable location. An underground subway station and express bus to Tegel airport are next door, and underground parking is on the premises. 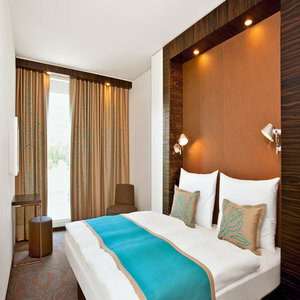 Motel One Berlin-Ku Damm offers rooms with comfortable beds and free Wireless internet with breakfast. Nearby internet cafe and an internet station in the lobby are helpful for those without laptops. Nicely-decorated rooms, with comfortable beds and flat screen, plasma television. Clean, pleasantly decorated rooms face the courtyard or train station. Rooms are insulated and very quiet. Double or queen beds with duvets, large and small pillows, reading lamps, small table with stool, "sofa chair,Ã¢â¬Â wall shelving, and wardrobe area. Well-located between the exhibition center and city center. Close to the underground subway. Situated close to train station, Zoologischer Garten, it is good for business trips, as well as leisure trips and exploring the city. When arriving at Schoenefeld airport, the Airport Express train stops at Zoologischer Garten within thirty minutes. The motel is located about two blocks from the Berlin Zoological Gardens, and the central shopping area is very close.